Nancy and I love words—the texture of them, the way good words roll off the tongue. FRIENDLY SCRABBLE is made for people like us. We mean friendly in every way: you can look up a word, ask your partner about it, take as long as you need to play, and we don’t keep score. 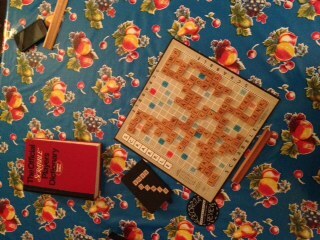 The goal of FRIENDLY SCRABBLE is to make words of grace and beauty that fit nicely on the board. God bless Mister Alfred Butts.